Successfully Added Sunroad FR721 Sports Watch - Barometer, Altimeter, Thermometer, Weather Forecast, Time, Date, Alarm, Waterproof to your Shopping Cart. The Sunroad FR721 Sports Watch and Fishing Barometer that has been specifically designed for fishing lovers. This fishing watch keeps accurate track of an abundance of environmental settings, allowing it to provide you with highly accurate information on the best fishing times. From now on you’ll be able to take the absolute most out of all your upcoming fishing adventures and, thanks to its bright backlit display, you’ll even be able to use all its features while out fishing at night. This outdoor watch significantly increases your chance on a successful fishing trip, bringing along countless hours of outdoor joy and entertainment. Packing an abundance of outdoor features, this fishing watch contains an altimeter, barometer, thermometer, stopwatch, and alarm. It additionally is capable of keeping fishing data recordings and produces highly accurate reports of temperature and air pressure development throughout the past three days. Being waterproof up to 50m, you can confidently wear this outdoor watch on your next fishing trip without needing to worry about getting it wet. Besides its wide offering of outdoor features and tools, this outdoor gadget furthermore displays the time, date, and weather forecast. Additionally, it comes with an efficient stopwatch, countdown, and alarm function – even further increasing its usability. 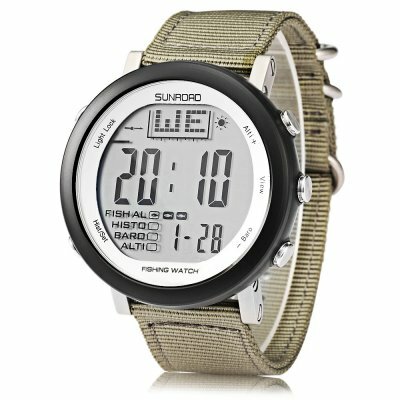 Based on all the information this sports watch is tracking, it will be able to inform you about the best fishing times in a certain area. Capable of tracking 6 locations at once, it will notify you whenever a perfect fishing situation has been detected based upon inter alia the air pressure and temperature in a specific region. Although specifically designed for fishermen, this watch is the perfect outdoor gadget that can be perfectly used by all outdoor enthusiasts out there during hikes, bike rides, mountain climbing, and more. With its durable stainless steel body and mineral glass, it features a strong design that has been made to withstand the toughest of environments. Its nice nylon strap gives this watch a stylish finish, allowing you to wear it with confidence at any occasion. Suitable for both boys and girls, this is the perfect outdoor gadget that’s sure to put a smile on the faces of all fishing lovers and outdoorsmen. The Sunroad FR721 Digital Fishing Barometer comes with a 12 months warranty, brought to you by the leader in electronic devices as well as wholesale electronic gadgets..
Yeas good product, delivery time CZECH rep., price, desing and function. Thansk Chinavasion.